We used interferometric synthetic aperture radar (InSAR) measurements to reveal that the surface deformed surprisingly little compared to what would be expected if the fault zone were to relax the stress changes imposed upon it by the earthquake. The fact there is so little post-seismic surface deformation at Bam can be used to place upper bounds on how much the fault zone is deforming at depth. We used a combination of viscoelastic and afterslip fault models to show that < 20% of the co-seismic stress changes on the bottom 10 km of the fault can be relaxed by post-seismic mechanisms before the models would no longer agree with our observations. This result implies that a significant component of both inter- and co-seismically accumulated elastic strain remains on the bottom 10 km of the fault zone at Bam, enough to cause a future Mw >6 earthquake on the same fault. In addition to a lack of long-wavelength ground deformation, we also found that there is far less ground motion in the near-field around the shallow fault zone than expected. 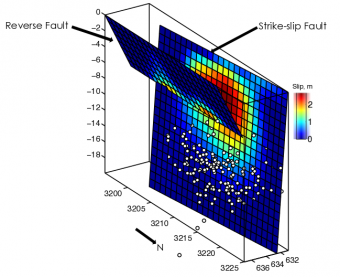 By using fault mechanical models that simulate post-seismic afterslip driven by earthquake stress changes (so-called ‘stress-driven afterslip models’), we demonstrated that the majority of the fault zone around Bam could in fact be locked and not creep at all. Comparison of observed surface deformation (a) against models in which the fault relaxes only part (b) or all (c) of the co-seismic stress changes. If the fault zone around the 2003 rupture at Bam is in fact locked, this poses a serious future seismic hazard. No historical earthquakes had occurred at Bam in over 2000 years , therefore it seems likely that any stress changes in the 2003 earthquake will have loaded the adjacent segments of the fault that are already near breaking point. As such, the Bam earthquake only acted to raise the seismic hazard in the region by bringing the area around the co-seismic rupture closer to failure. Comparisons can be drawn with other earthquakes that appear to have only partially ruptured through the seismogenic layer (e.g., 2008/2009 Qaidam earthquakes ; 1981 Sirch & 1998 Golbaf earthquakes ). The two aforementioned earthquake sequences re-ruptured the same fault at different depths, with a delay time of 10 months and 17 years between events, respectively, which is significantly shorter than the average repeat interval for earthquakes in Iran (>1000 years). This opens the possibility of another earthquake directly beneath Bam within the lifetime of the survivors of the 2003 event. The statistics detailing the utter destruction caused by the Bam earthquake are rather startling. After 2003, 97% of all buildings had been destroyed or were damaged beyond repair, 10% of the population had died, and 20% of the remaining population were homeless . One of the main causes of such damage from this event was that > 50% of all residential properties were constructed from traditional adobe bricks and clay, which are susceptible to roof collapse during shaking. With the current seismic hazard at Bam remaining high, it is as important as ever to ensure that reconstruction of the city adheres strictly to the Iranian National Building Standards. As of 2014, official statistics suggest that only 4.1% of all buildings in Bam are constructed in the traditional adobe brick style, a significant improvement compared to pre-2003 . Most of the new properties have been constructed using steel framing and reinforced concrete. This is a step in the right direction, and hopefully the much smaller number of un-reinforced homes is likely to reduce the potential for such devastation in future earthquakes. Earthquakes in almost the whole of Iran are inevitable and unavoidable. It is therefore paramount that, to avoid future disasters, Iran must prepare its entire population for large earthquakes. Focus has shifted recently to the country’s mega-city capital, Tehran, which has a population similar to Los Angeles. It is clear that the southern edge of the Alborz mountains is associated with active faulting , and that the risk of a major earthquake directly beneath the city is very real. If the Bam earthquake has taught us anything, it is that poor construction and proximity to shallow faulting will eventually have disastrous effects on human populations unless a major reconstruction program is undertaken soon.